The design of the Rejuvenate spary mop is simple, yet effective. As the name suggests, this mop is built on a “click n clean” frame. What does Click n Clean mean? Simply put, the Click n Clean name means that the body of this mop is built on a quick-release click system. In other words, the wand snaps into the cleaning head and the cleaning heads can be swapped in out with a quick click of a button and snapping in of a new head. What does the rest of the mop look like? Along the top of the mop is the handle. The handle also contains a squuezable trigger that is used to spray the floor in front of you when cleaning solution is added to the mop. Moving down the body of the mop is the cleaning solution port. This is the area where users will insert the Rejuvenate cleaning solution bottles. Once clicked into place, the trigger on the handle will compress the bottle and spray the solution on the floor in front of the mop. How about the cleaning head? The cleaning head is fairly simple. Once clicked into place, the main cleaning head can hold a microfiber cleaning or dusting pad, via velcro. In addition, there is a scrubbing pad located along the backside of the main cleaning head. This scrubbing pad can be used by flipping the mop head over and scrubbing your floor when more agitation is needed. How does the Rejuvenate spray mop work? This mop works by spraying a cleaning solution in front of the cleaning head (if needed) and pushing the mop over the solution. There is no difficult porcess required in order to operate this mop, but it is more of a manual cleaner than robot mops or steam mops. Users do have the optin of swapping cleaning heads from the traditional spray mop head to a grout cleaner head, but the mop still works in the same way. The Rejuvenate spray mop is fairly average in size. The handle does not extend, so once assembled, you are looking at the full size of the mop. How big is the mop? Compared to most spray mops, the Rejuvenate falls into the middle of the pack. While it is heavier than most, such as the Rubbermaid Reveal spray mop, the dimensions of the mop are quite similar. GROUT TOOL | The grout tool is a separate cleaning head that can be attached to the Rejuvenate spray mop and used to clean your grout. MICROFIBER DUSTING PAD | The dusting pad is used to complete a dry cleaning cycle when users are looking to simply dust their floors without any cleaning solution. MICROFIBER CLEANING PAD | The cleaning pad is similar to the dusting pad, yet this one is to be used when the cleaning solution is applied to your floor. To be able to tell the difference between these two cleaning pads, Rejuvenate colored this one blue and the other white. BOTTLE ADAPTERS | These adapters can be used to turn any Rejuvenate bottle into a spray bottle that can be inserted into the mop for cleaning. The Rejuvenate Click n Clean spray mop does not offer a ton of features, but the ones it does offer are certainly impressive. To begin with, this spray mop has the more traditional cleaning head with the dusting and scrubbing pads, in addition to a grout cleaner cleaning head. By adding the grout cleaner head to the mix, the Rejuvenate spray mop is able to offer a lot more in terms of cleaning capabilities. Similar to most spray mops, the Rejuvenate can be used for quick fix cleaings. There is no need to grab a bucket and start mixing cleaning solutions. Simply pop the solution into the Reuvenate’s bottle reservoir, spray, and start cleaning. The process is fairly quick. The overall cleaning performance of the Rejuvenate spray mop was quite good. It was not the best we’ve seen to date, but it is certainly in the upper tier of spray mops. After applying all of the debris to our testing lane we moved forward with using the spray mop to clean each of them up. In a single pass, the Rejuvenate spray mop was able to get through the mud with ease. The honey was a bit more of a struggle, as it did leave a little honey on our testing lane. That said, after a few more passes across the honey we were able to remove virtually all of it from the tile flooring. The water test was interesting, as the cleaning pad on the Rejuvenate was able to soak up all of the water. However, it did have a tendency to spread that water across the flooring after soaking it up. Therefore, you would need to remove and wash the pad each time you were to mop up a significant volume of liquid. Next up was our grout cleaning test. For this test we used the tile flooring that had a strip of dirty grout. From there, we simply applied the grout cleaning head to the Rejuvenate spray mop and cleaned the grout. After testing, we found that the grout cleaning tool was effective and a nice additon to the mop. Using the Rejuvenate spray mop is simple, which is directly correlated to the maneuverability of this mop as well. As a spray mop, it is able to move with ease and goes where you go. Does the weight make a difference? Although slightly heavier than some of the other spray mops we have tested, the weight does not make much of a difference. The Rejuvenate is able to glide across the floor in both dry and wet cleaning mode, which is a major bonus as a spray mop. One minor flaw we did notice on the Rejuvenate spray mop was its ability to spray the cleaning solution in front of the cleaning head. If held in a more verticle position, the spray will get more on the mop itself (and not the floors). As a result, we found that we really needed to angle the handle back in order to get the spray angle sufficiently out in front of the mop and onto the floor. While neither the main cleaning head or the grout cleaner cleaning head rotate, the mop rotates with ease. Therefore, users are able to turn the mop by simply twisting the handle. This spray mop’s ability to slide so easily really helps the overall maneuverability, especially around furniture or other obstacles. RELATED – How does Rejuvenate compare? See our Bissell PowerFresh review and Rubbermaid Ratchet Twist mop review. Changing the cleaning solution is another simple task. When the bottle is empty, lift it up and away from the bottle reservoir on the body of the mop. As you replace it, apply a botltle adapter and slide the new bottle into the reservoir. Once it clicks into place you are ready to get back to work.RELATED: Want to compare the Rejuvenate? Check out more of our mop reviews here. Aside from these three areas, the Rejuvenate Click n Clean spray mop is fairly straightforward. Is Rejuvenate mop a good value? All in all, the Rejuvenate spray mop offers a good value. The performance didn’t blow me away, however, for the price point it’s still solid. On the other hand, this mop includes a decent number of accessories, including a grout cleaner tool. 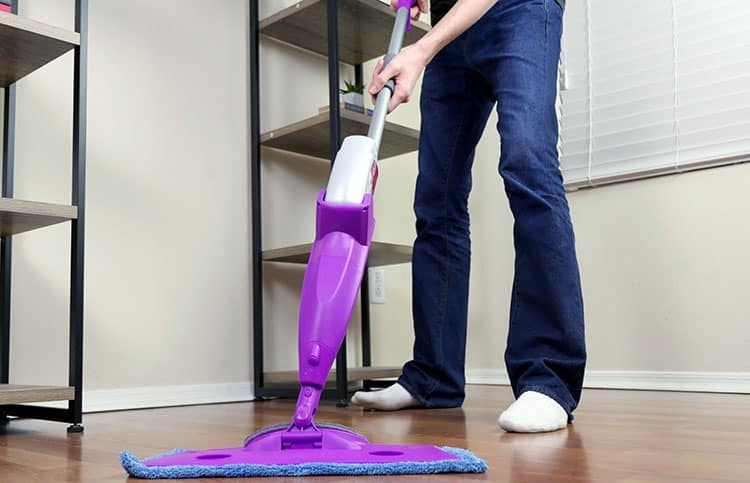 This tool, in addition to the multiple floor cleaning pads adds a degree of versatility, helping the mop to achieve a few more bonus points. Finally, the simplicity of this mop is hard to beat. The Click n Clean design allows you to swap between cleaning modes quickly, giving users the chance to tackle more specific messes more efficiently. Who Should Buy the Rejuvenate Mop? The Rejuvenate spray mop is a good optin for anyone that is in need of a simple mop that can get the job done. Want a mop and grout cleaner: The Rejuvenate Click n Clean spray mop has multiple cleaning heads (standard and grout cleaner) that allow you to perform normal mopping sessions as well as clean your grout. If you’re in need of both, this mop could be a great fit. Like the idea of a simple design: This mop is not a complicated one. It is easy to assemble, easy to use, and easy to maintain. Want a quick-fix mop that performs well: Aside from its ease of use and low cost, this spray mop is a strong performer. It may not be the best of the best, but its added versatility and cleaning attachements give it a leg up in other areas. For more information on the Rejuvenate spray mop, see here. Why did the Reuvenate Click n Clean spray mop score the way it did? Spray mop & Grout cleaner? Awesome! The Rejuvenate Click n Clean spray mop is a well-designed mop that has the ability to handle a wide variety of messes. Additionally, this spray mop includes a grout cleaning tool, meaning users have the ability to mop, dust, and clean grout all with one mop. As a low cost option, this mop included a good number of accessories and cleans at an above average level. If you’re on the hunt for a new mop, the Rejuvenate Click n Clean spray mop is one to consider.